Every manufacturer depends on reliable industrial-grade cleaning equipment to clean their workstations and manufactured parts. These cleaning equipment help keep the workplace and equipment clean, as well as ensure the user’s safety. MiJET is industry-leading cleaning equipment that is regularly used in manufacturing facilities to clean chips and oily residues. 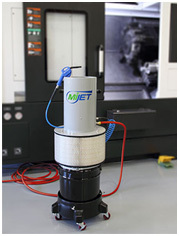 MiJET equipment is designed for use at inspection stations, or CNC machines, and is available in various configurations. This post introduces you to one of the popular washing stations – the 8ʺ diameter MiJET blind hole cleaning unit. We will also discuss its features, working mechanisms, and benefits. What is the Diameter 8ʺ MiJET Blind Hole Cleaning Unit? As the name suggests, these MiJET cleaning units are designed for deep containers, drilled holes, and grooves where debris, scrap, and dirt are found. These cleaning stations are manually activated by a hand-held nozzle, and foot pedal. The cleaning unit is provided with a ¼ʺ FNPT fitting that can be easily connected to any existing air line at the shop. There is a quick-connect adaptor provided that can be attached for easy use. All debris and dirt is gathered in the collection unit at the touch of a button. This easy collection protects an operator from any allergies caused due to contaminants. This cleaning line can also be used with a 3/8ʺ diameter air hose drawn from the main air line. However, please note, a smaller diameter air hose or a coiled air hose should be avoided, because these cannot provide sufficient air supply. What are the Replacement Parts Available for Diameter the 8ʺ MiJET Blind Hole Cleaning Unit? What are the Benefits of MiJET Cleaning Stations? Air free with reduced mist and dust. Easy recycling of collected debris. This helps save money on expensive lubrication products. What are the Safety Precautions to be Taken While Using MiJET Cleaning Stations? Follow the user guide thoroughly during the installation and use. Disconnect the air supply, if the unit is detached for cleaning, parts retrieval, or coolant recycling. The unit should not be used with inflammable liquids. If you have decided to invest in a robust cleaning equipment for your manufacturing unit, you should consider the 8ʺ MiJET cleaning unit. After reading the above information, you might have already gotten an idea how it can be an asset to your manufacturing facility. You can purchase this product from the respected industrial tool and monitoring systems supplier, Techna-Tool Inc. The company has successfully installed these washing stations at various work locations.